Dear Readers, have a look at the photograph above and see how many fledgling starlings you can count. 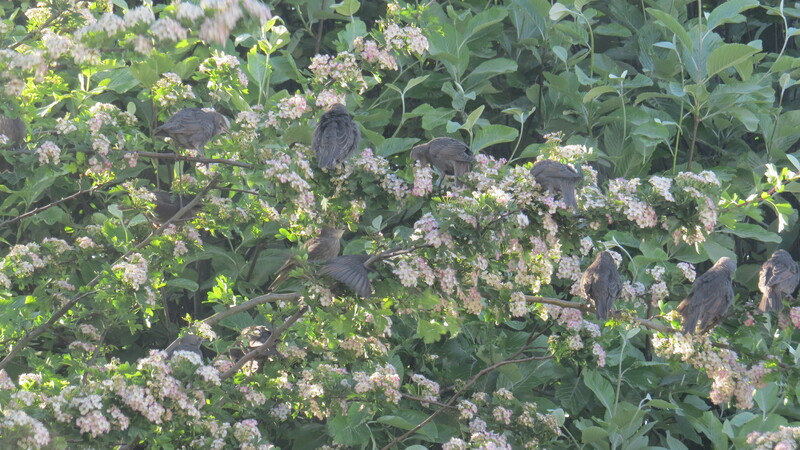 This is one branch of my Hawthorn tree, and on Thursday this week it was a heaving, wheezing mass of babies. 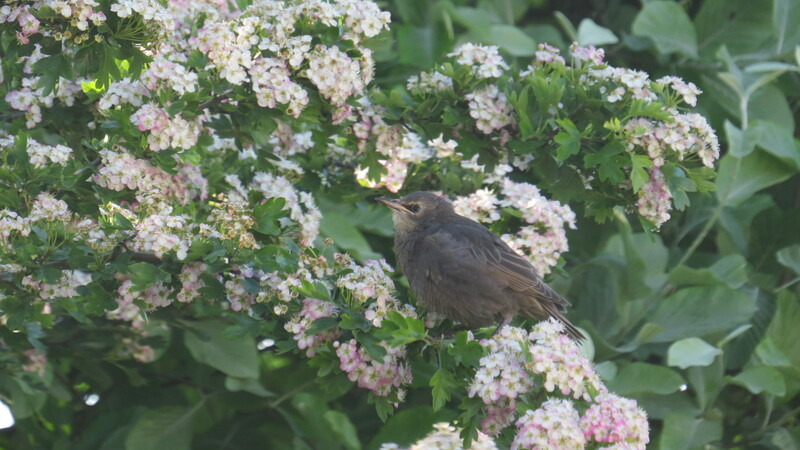 Every year, the youngsters emerge en masse and I am always touched that the parents bring them to my garden, though I suspect the neighbours are not so impressed with the noise and mess and general kerfuffle from dawn till dusk. When they first leave the hollow tree that has been their home for the first few weeks of their lives, the fledglings seem wide-eyed with wonder. They follow their parents to the hawthorn tree, and sit there waiting for something to eat. While they wait, they investigate. The urge to peck anything that looks remotely edible reminds me of the way that human babies investigate everything mouth-first. The fledglings spend a lot of time looking up hopefully, and wheezing every time an adult hoves into view. How the adults identify which baby is theirs is one of those mysteries of nature, but each youngster is as distinctive to his or her parents as our babies are to us. The adults, strangely enough, seem rather relaxed. Do they know that the most frantic part of their job is over, and that soon their offspring will be independent? Or are they just exhausted and having a breather? I have been in this house since the autumn of 2010, and every spring brings this flush of new life. I like to think that some of these birds are the youngsters of previous years, who are bringing their own fledglings to a reliable source of food. Feeding wild creatures is a big responsibility – although animals will find alternative sources of food if we suddenly stop providing for them, they are very vulnerable at times when they need extra supplies, such as now, or during a cold winter. I always have some food on offer, but try to adjust the quantities according to need. 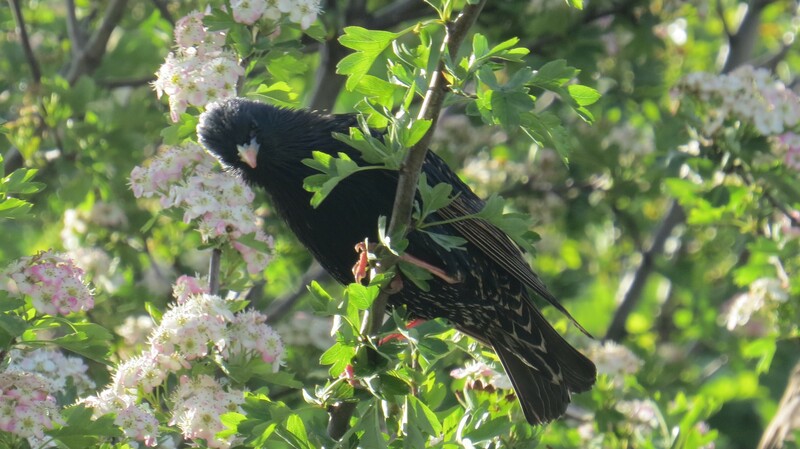 An added incentive for year-round feeding is that starlings are a Red List species – according to the British Trust for Ornithology, their numbers have dropped by 80% nationally since the 1970’s. 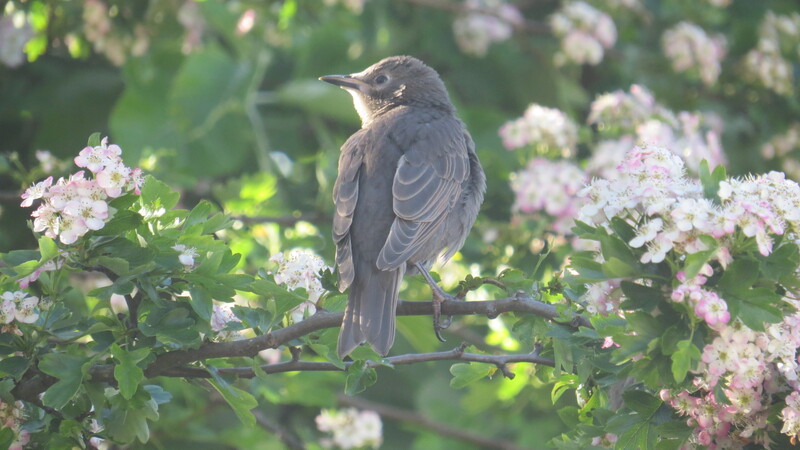 One reason for this is that fewer fledglings survive, possibly due to the difficulty in finding food during our drier summers, so I like to make sure that there is always some food available. In a week or so, the fledglings will have learned to feed themselves, and will start to disperse. The frenetic pace in the garden will die down, and things will go back to normal. 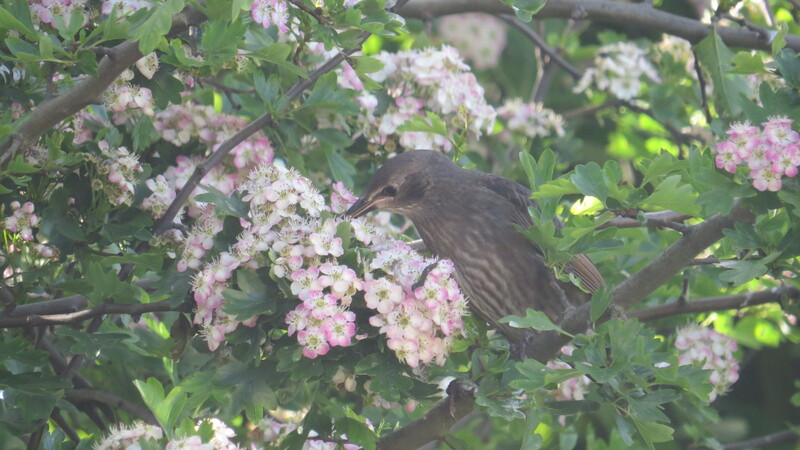 But for now, the hawthorn tree reverberates to the sound of hungry youngsters, and the starlings have left their ‘mark’ all over the garden furniture. My bird food budget is well and truly blown, and the man who delivers the suet pellets has probably developed a hernia from lifting all the heavy boxes. But there is something about this great burst of animal fertility that fills me with hope. In spite of everything that we are doing to mess things up, some things are still working. 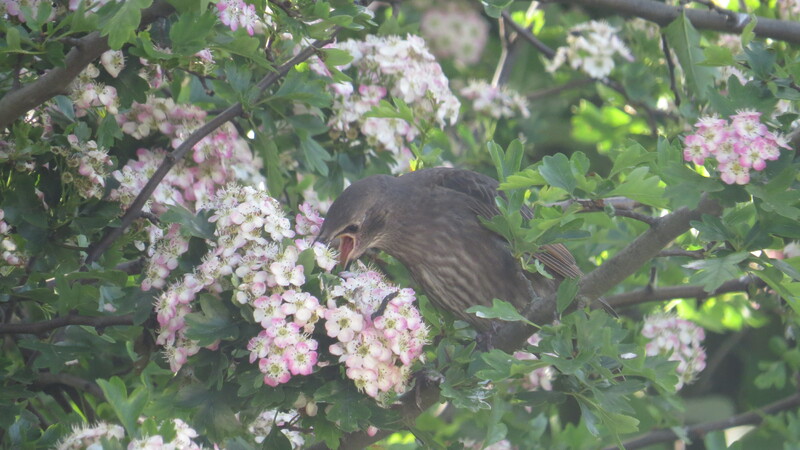 This entry was posted in London Birds on May 23, 2015 by Bug Woman. I used to live in a city and loved watching the starlings who were commonplace and loved the evening murmurations at sunset over the skyline…I have lived in a small country village in Worcesteshire for 23 years and only this week I saw the first ever starling who was sitting happily minding his own business when a blackbird came by and drove him off! It was good to see this little chap for the first time and add him to my garden list…but maybe the lack of them is sadly something to do with their decline in Great Britain in general. You are lucky to have such a gregarious bunch in your garden each year! Thanks for your article!! There used to be huge murmurations in central London, Anne, one in St James’s Park and another in Leicester Square – both are gone now. I can see that the one in Leicester Square might have been a bit of a nuisance, but the St James’s Park one was on an island, and people would gather at the edge of the lake specifically to watch it. Not sure why they relocated, but London is the poorer for losing one of the most extraordinary sights the natural world has to offer. 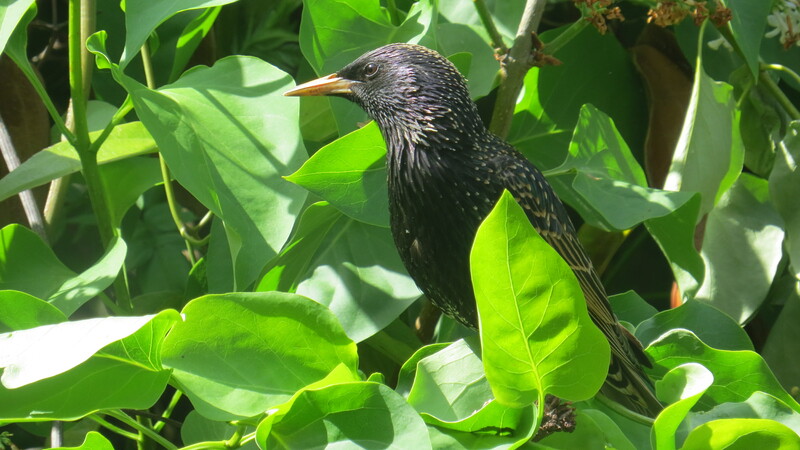 Glad you saw a starling, though – where there’s one, there are likely to be more! plane tree in the High Road opposite the gravestones shop. For most of the year it’s full of starlings; they fizz and chuckle, such clearly social birds, and hardly anyone looks up at them. I must go and pay a visit with my camera, Ann. I wonder where they nest? I’ve never noticed them in Coldfall Wood or the cemetery, in spite of all the nice big trees. Maybe there’s just too much competition from everybody else. Thanks, Maria! Do you have any starling species where you live? No, not at all. That is a European bird, although who knows, maybe they will make it here. These are the highly adaptable species, like the house sparrow, who will adapt with more ease than other species. 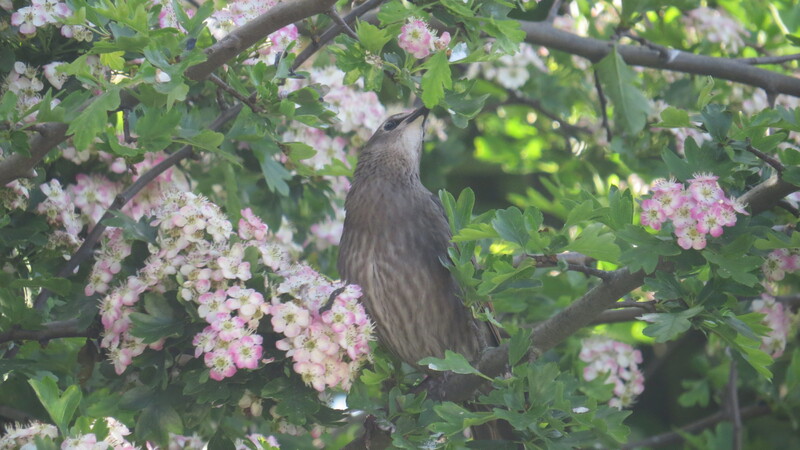 I know that the European Starling was introduced to North America, where it has proved to be something of a pest…I see that naturally they’re Old World birds though. Some very colourful species in Asia and Africa! And always the same personality – sociable, noisy, intelligent, adaptable. Used to see loads of these ‘oil slick’ colored birds when i leaved ten miles away in Buckley, but here in the village not a one have I glimpsed. ‘Leaved’ is rather fine, I think! And congratulations on your 50th my dear. Sounds like you had a thoroughly spiffing day. I am a great fan of steam engines myself. And I have tried to subscribe to your blog so I can keep up with your Lumix adventures…. Ooh, and I should mention that I have a Canon bridge camera. It’s amazing what you can do with them, and no need to swap lenses etc.